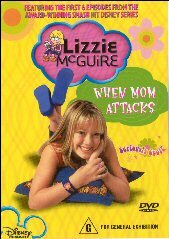 Lizzie McGuire has just recently become a very popular movie and in mostly in part due to the success of the series by Disney, now with the technology we can get back to the start and purchase the very first six episodes of Lizzie McGuire now on DVD; When Mom Attacks.. The episodes contained here in closely relate to the bond between mother and daughter and as Lizzie�s growing up and encountering all sorts of problems at school, her mother tries to come to her rescue, but being a teenager Lizzie only seems to think that her mother is just butting in though she does do the right thing and let her mom try to help. As you can guess Lizzie and her little brother don�t exactly get along real well but the dynamic between brother and sister leads to some very funny and interesting scenes. I do find that the stereotype of men not being able to cook is annoying but for its comedic value it does make one of the episodes really entertaining. As you can probably tell there are many instances of stereotyping all through the entire series, but it does have it pros and cons. It does a great job of not offending people and it makes the jokes a lot easier to understand by using well known stereotypes and the target audience of younger boys and girls means all you parents out there wont be bothered with questions like �What does that mean� and �I don�t get it�. Not only does Lizzie�s antics bring enjoyment to the viewing audience by the situations she gets into and how she must deal, but there is also a little cartoon figure that pops in out and out of scenes, this cartoon character is in fact Lizzie�s thoughts and it brings a great break into the story and tell you exactly what Lizzie is thinking and in some cases what she would like to do. There is an episode where her very smart friend is always given a B in science and his work is well above the class standard and other students are getting A�s, when Lizzie�s brother is duped by his parents to adopt his old name back after calling himself M DOGG, the cartoon character expresses her concerns about the Jedi mind tricks that many adults play on kids to mold them into what they want; a bit of reverse psychology. I found this particular remark very amusing and I got some strange looks from people around me when I laughed out loudly. So you can see that Lizzie McGuire is not just for pre-teen girls but for people of all types, young, old, male, female. Lizzie McGuire is a great addition to anyone�s DVD repertoire and I look forward to seeing many other Lizzie McGuire DVD�s. 101 - Pool Party, the first episode is about how the two best friends Lizzie and Miranda are invited to the hottest party by the most popular guy but Lizzie isn�t allowed to go and they learn the true nature of friendship and loyalty. 103 � Rumors, Lizzie accidentally starts a rumor about the most popular girl (Kate) in school by accidentally sending out a chat message on her computer to everyone instead of just her best friend and all hell breaks loose when Kate seeks revenge on the guilty party. 104 - I�ve Got Rhythmic, Lizzie is having trouble finding her gift, something she is good at that no one else can do as well, but when she finds out what it is Kate tries to foil; her attempts of winning a competition though Lizzie learns that it�s whether or not you enjoy what you do instead of how good you are at it. 105 - When Mom Attacks, An overnight science camp, leaves the girls from the class with out a chaperone and when they find a replacement just in the nick of time Lizzie is shocked to find out that its her mother. Lizzie has a lot of difficulty getting along with her mother even though all the other girls at the camp are having a great time with her Lizzie still thinks her mum is out to ruin everything. 106 - Jack of All Trades, Matt Lizzie�s little brother has a new identity � M-Dogg, at the same time Lizzie�s other friend Gordo is feeling unappreciated in science class even though his assignments are far greater that everyone else�s. However the adults (Matt�s Parents and the science teacher) have only been trying to teach the kids a lesson in self discovery. Video and sound quality is clear and well presented, the colors are bright and the light contrast is always perfect. Extras, at the end of each episode if you let it run through the credits you will be able to watch some outtakes, and you can take a peak at the biographies on Hilary Duff, Laline and Adam Lamburg, some pictures also exist. If you put the DVD into your computer DVD-ROM there is a screen saver and also a wallpaper.